Congratulations to Shiho Satsuka on the publication of her book Nature in Translation: Japanese Tourism Encounters the Canadian Rockies (Duke University Press, 2015). 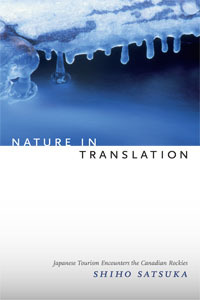 Nature in Translation is an ethnographic exploration in the cultural politics of the translation of knowledge about nature. Shiho Satsuka follows the Japanese tour guides who lead hikes, nature walks, and sightseeing bus tours for Japanese tourists in Canada’s Banff National Park and illustrates how they aspired to become local “nature interpreters” by learning the ecological knowledge authorized by the National Park. The guides assumed the universal appeal of Canada’s magnificent nature, but their struggle in translating nature reveals that our understanding of nature—including scientific knowledge—is always shaped by the specific socio-cultural concerns of the particular historical context. These include the changing meanings of work in a neoliberal economy, as well as culturally-specific dreams of finding freedom and self-actualization in Canada’s vast nature. Drawing on nearly two years of fieldwork in Banff and a decade of conversations with the guides, Satsuka argues that knowing nature is an unending process of cultural translation, full of tensions, contradictions, and frictions. Ultimately, the translation of nature concerns what counts as human, what kind of society is envisioned, and who is included and excluded in the society as a legitimate subject. Shiho Satsuka is an Associate Professor in the Department of Anthropology at the University of Toronto, a TRU member, and was an organizer of the Critical Itineraries Technoscience Salon for 2013-14.